Dr. Charles Stanley (www.intouch.org) said that the Biblical basis of worldwide missions is to carry out God’s will by the witness of His people and the church. And for that purpose alone, He empowers us (Act 1:8) to witness the world His goodness (Matt 5:16), not just to enjoy happy lives for ourselves. Since the world is so messed up (Eph 2:1-3), our God cares about the people (Rom 10:13), He wants us to wake them up (Rom 10:14) by our own witnessing or send others (Rom 10:15). So we are either goers or senders in God’s world. As for Mission Harmony to Taiwan and China, the additional Biblical basis for Taiwan mission is to return to God the glory long given to other gods(Isa 42:8-12), and for China mission is to build God’s army to fight the anti-Christ at the end time(Dan 11:44, Rev 9:15, 16:12). 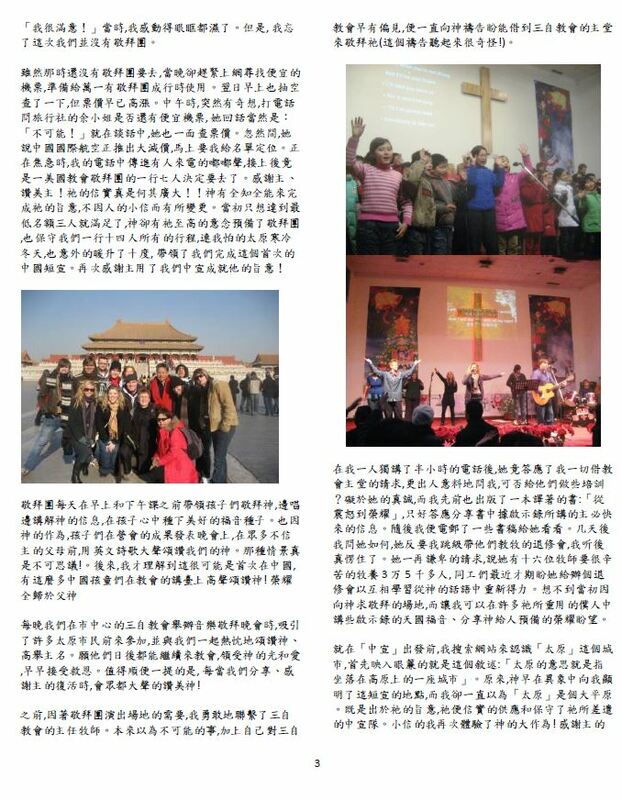 The calling of Mission Taiwan is “to sing to the Lord a new song to praise Him”(Isa 42:10) by leading people there to exalt Him in worship, witnessing Him with our multi-church team serving together “under one God, one faith and one baptism(Eph 4:5)” in harmony so that people may believe Jesus is from God(John 17:21), and rejoicing in Him to spread His love. 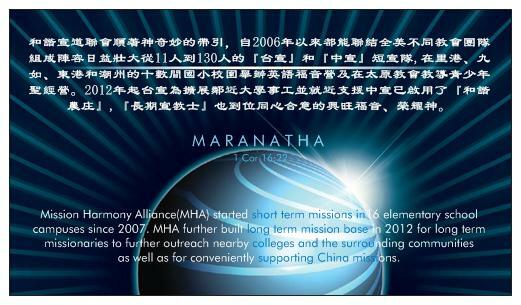 On the calling of China mission, it’s in God’s end time plan. Israelis are God’s chose people, He cares about them to the end. Israel has depended on USA to survive and to thrive in this end time. At the time of the end (Dan 11:4)) when the anti-Christ invades Israel to slaughter them (Dan 11:41), and magnifies himself above God (Dan 11:37-38), from where will her rescuer come? Not USA, but China (Dan 11:44), how unbelievable it is! So we going to mission China and Taiwan are keenly in God’s mind, and so honored to follow His will in carrying out His plan. Alleluia! On the last day of the annual English Gospel Camp I was shocked when a big boy in the hallway told me: “I am about to cry”. Holding my breath on thinking of what to say on that kind of trouble he may have, then , he turned his head away and said: “You are all leaving soon”. Sister Joan was so touched to see 4 girls weeping together heavily in the final day, it was the first time in her 8 years of mission. In her heart she deeply believed that the holy Spirit will continue to lead them to Christ thru the love they received in their hearts. As we were exiting the school, a girl holding her mom told us, she was sad because she will graduate next year. Amy and I told her to come back to work as a teaching assistant. Reflecting on the past 10 years of Taiwan mission, many of the over 10 thousands of students have graduated from college, some became believers, some were studying in the seminary and some more went on to be ministers serving in churches and missionaries. Praise the Lord for His calling over 700s of brothers and sisters in Christ from US and aboard to fulfill His good purpose by using Mission Taiwan ministry in these 11 years. Pray to Jesus for continuing to send us to extend His glorious kingdom in Taiwan. Something special about this year’s mission, in several occasions some local brothers and sisters came up to tell me that they came believers all because of learning about Jesus in their childhood. They encouraged us to press on, doing this very meaningful job! Amen! It’s evident that God has been doing amazing work thru the Taiwan Mission ministry! You know, when Cherry n I ran back to deliver gifts to the students, we saw two 5th grade boys crying. We took a few pictures w them n some remaining 5th grade students. As I look at the photos, we can still see the sadness in their faces. Our good good Father is compassionate. He has began His good work in them n He will bring it to completion. The harvest is at hand, may He raise workers to partner with Him! 台東 – 屏東 – 桃園的宣道結束後，佩帆繼續進行兩場營會：宜蘭(75人，20隊員)及台北(55人，6隊員)。都因各地隊員一心的擺上為主爭戰，齊力合一的完成了今年的台宣使命。耶穌心慰的像對過去的隊員一樣，也對我們今年的台宣隊員說了: 「又良善又忠心的僕人!」(太25:21, 23)。感謝讚美主! First time we did Taidong mission(~110 students, 21 teammates), having experienced Pindong mission for years, we were totally amazed by students’ attention and enthusiasm to learn about God and English. One afternoon we visited a nursing home to comfort 30 so old folks. After singspiration, I was invited to give a spontaneous message, afterwards, I called them to receive Jesus by waving both hands in their wheelchairs. Instantly, 8 joyfully received Jesus, two more after personal consultation. Later in the evening, we all went to pray for the church being started in the tribal village and worshiped God there. Next, another Mission Taiwan team of 80 teammates conducted 10 camps in 10 schools from Ligang to Dongang with ~600 students. Thanks to Doris’ hard work , the whole team was able to stay in one nice conference center. We had a new strategy for this years’ mission, three English message speakers were going around to proclaim Gospel in each camp. And this was just arrangement only in the last few days by God’s will. Thanks be to God, it helps a lot. Especially, one speaker is a magician from Japan, using magic to explain the gospel*, raising sensational responses from all kids and their joyful screaming were heard all over the campuses. Right during the rehearsals of our camps’ final presentations, the super Typhoon came, we had to presented it earlier, just in time to wrap up the camp and departed safely. Just before going home, Magic ED and me conducted the final weekend mission in a Taoyuan church of ~350 people. ED was proclaiming the truth with his magic to raise all kinds of sensations and again, with screaming laugh like in Pingdong. I delivered the Sunday message three times. Upon finishing the last one, I made a altar call, one raised hand, called again, two more, then being touched, I asked those who raised hands to come to front for the prayers by the whole church. To my surprise, many folks were walking to the front, ~20, praising God for the great power of His word to change people’s lives. As Taidong, Pingdong and Taoyuan missions were completed, Peifan diligently led two more camps in Yilan( 75 students with 20 teammates) and Taipei(55 students with 6 teammates). It is all due to our teammates single minded to fight the spiritual warfare for Christ, they were working harmoniously in unity to once again fulfill God’s great commission in this year’s Taiwan mission. Jesus said to our MT 21016 teammates just as those Mission Taiwan teams before: “Well done, good and faithful servants!” (Mat 25:21, 23). * In one act, he asked the children for a snicker to fill a drink, as he poured down the water into the shoe, kids were screaming. Then, he pulled out a cup of black water from the snicker and asked anyone to drink it, they all despised him. In unbearable disguise he raised the cup and drank it amid the screaming of all the children. He then said to them, I drank the cup of your dirty feet washing water to clean your feet. And so your heart was as dirty as your feet, likewise, Jesus drank the dirty heart washing water for you to clean your heart. **In one new school camp we encountered a strong will woman pastor who insisted on leading the camp and asked her young co-workers to lead the worship and taught some English words. We had to stand by and watched in despair, the result was loud scolding from the altar and naughtily noisy reaction from the students. In the evening team meeting, we decided to take back the camp. On the next day we were back in full control, led by Morris, soon the camp was filled with love and encouragement, in lesser than one hour the kids were happily singing the hymns on the stage one class after another, enjoying the love of God. Welcome aboard MT 2016’s English Gospel Camp! But we cannot really teach much English, since most of the kids, even at middle grades, are still at the 1st grade level. For a week of camp we will try to let the kids experience the live English with us through our interaction with them in listening and speaking, instead of focusing on learning some vocabularies and grammars. Hopefully by doing so, they will somewhat overcome the barrier inside and start to learn English at ease. However we surely can share God’s love easily no matter how small the kids are. The number one thing to share God’s love is the everlasting endurance (fortunately, it’s only 5 days! ), from us those kids will feel the love and want to seek our God of the true love. Prayerfully, every kid at the end will say that I like to learn English and know Jesus as well, just like those kids wrote down on their camp feedback forms before. May God’ grace be with you always. 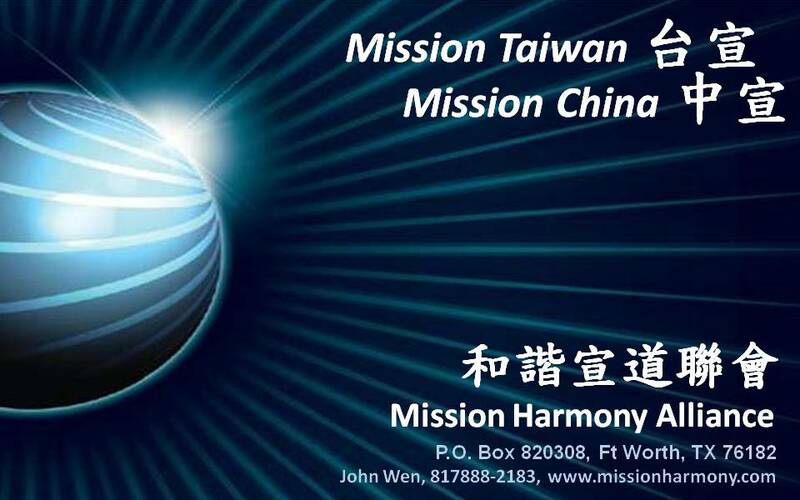 In fulfilling God’s will, Mission Harmony(MH) to Taiwan and China is announcing this year’s mission from 7/5 to 10 in Taiwan and 6/28 to 7/3 in China. By His grace this is MH’s 9th year missions with our team of 130 teammates in 2014 from many parts of the country. In the past 8 years, we have outreached 4-5 thousands of elementary students and hundreds of college students working as translators via English Gospel Camps in 14 school campuses supported by local churches. This year, as more schools are asking for our English gospel camps, please pray for God’s calling coming upon you to share His love in Taiwan and China. See more info below. As I was reflecting on this 8th year’s mission on my way to the airport, waiting to board and on the flight, a feeling of mission accomplished came on with additional thought of Ligang revival meeting before the camp and Dongang college camp afterwards. Plus few days in Taipei with teammates’ fellowships at Anita’s home, mission meeting at Missy’s home and also with Live ABC company on mini camps, a blessed Sunday worship with Pastor Porter’s powerful message in Taipei International church and AWANA discussion afterwards, capped by the leading of Mr. Lia (who I shared gospel with after last year’s mission) to Christ with Anita and Pastor Wen of Hakka Seminary in Taoyuan. How great His grace is upon our MT 2014! May God continue to use us to fulfill His will in returning the glories of all kinds of gods back to Him and turning people’s praising of idols to Him in Taiwan (Isa 42:6-10). May our Father in heaven, hallowed be His name, His kingdom come, His will be done on earth as it is in heaven (Mat 6:9-10). 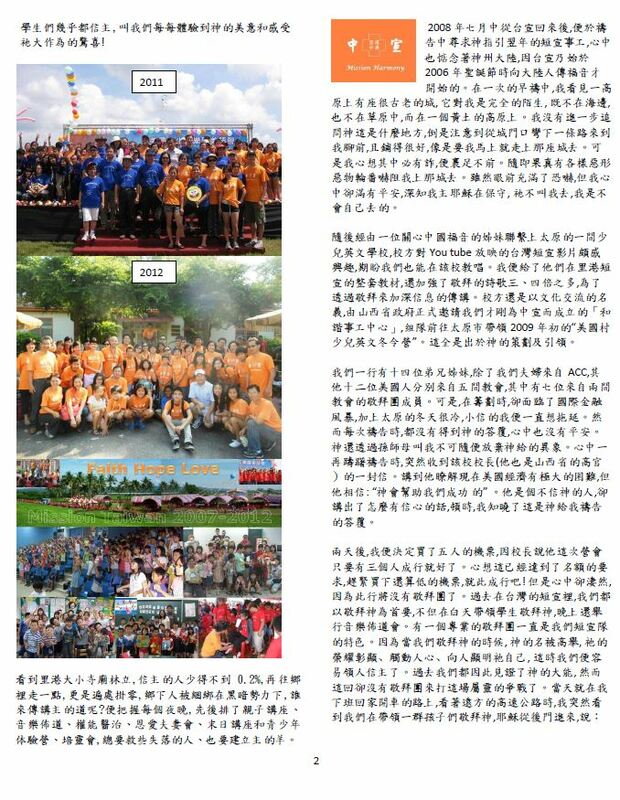 Each of us, Mission Taiwan, 2013 and in the past 6 years, is and has been sent by God “for the benefit of the people standing here” – in Taiwan, in USA, believers or non-believers standing around and watching. So they will see the glory of God and the mark of grace upon us. 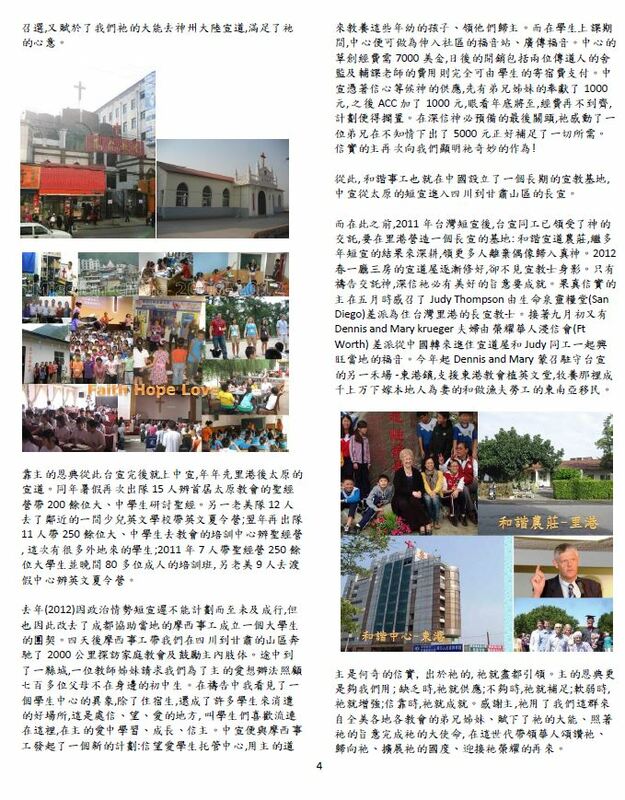 Please continue to pray for us and the students, elementary and college, and to remember our financial need in supporting long term mission house- currently Judy Thompson sent by San Diego Chinese Church, and another missionary is coming soon – Anna Lawler from Houston, TX..
May God bless us our chief end be to glorify Him and enjoy Him. Mission Harmony Alliance’s Mission Taiwan and Mission China teams exalt Jesus Christ who became flesh and dwelt among His people. And proclaim His gospel of Faith, Hope and Love to lead people to reconcile with God thru Jesus’ salvation so that whoever believes in Him may have eternal life to enjoy peace and joy in His kingdom.